If you didn’t watch the Christie’s auction of Michael Crichton’s art collection, you can see the high point—the auction of the painting Flag by Jasper Johns. The auctioneer for the sale was Christopher Burge (whom I found just marvelous to watch). Burge has portrayed an auctioneer in two films: The First Wives Club (1996) and Wall Street (1987). Did you know that you can watch the Christie’s auction of Michael Crichton’s art collection online? Just go to the website, click on “Calendar”, and click on the “Enter Sale” button for the auction. You can watch auctions as a viewer only. I watched a wine auction on Saturday. Nice spectator sport. The auction of Crichton’s art collection is in two parts. Make certain you get logged in well before the auctions begin, as things move fast. You can enter a sale up to 15 minutes before the start of the sale. It’s pleasant to think that there will come a day when I can actually bid during a Christie’s auction. But there’s something I would have to do to prepare. My small black female cat Asimov has an impressive talent for jumping on my computer at the worst possible moment. She’s caused so many problems over the years that her photo is on “Wanted” posters at call centers across the country. If your computer is logged on to Christie's Live™ and a successful bid is sent to Christie's from your computer, you are accepting personal liability to pay the purchase price, including the buyer's premium and all applicable taxes and other applicable charges. A live auction is by its nature fast-moving and competitive bidding can often progress very quickly. To ensure that online bidders are not placed at a disadvantage when bidding against bidders in the room or on the telephone, the procedure for placing bids through Christie's Live™ is a one-step process. As soon as the "Bid" button is clicked a bid is submitted. You acknowledge that this is necessary in order to ensure that online bids are submitted and received as promptly as bids from other sources. You also accept and agree that bids submitted in this way are final and that you will not under any circumstances be permitted to amend or retract your bid. So if I ever want to bid online during an auction, I must first secure the cats. My female cat is capable of blowing my entire credit limit on something I don’t even like. The July 1998 Architectural Digest article The Jurassic Park and Sphere Writer’s Los Angeles Residence is now online. The nine photos accompanying the piece show several artworks belonging to Michael Crichton. And one photo contains the family dog, a dachshund named Frankie. 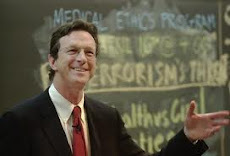 In April 2008, Michael Crichton gave a lecture on Jasper Johns at the Metropolitan Museum of Art in New York. Christie’s has posted an abridged transcript of the lecture on their website. The title of the lecture was In Search of an Artist: "Gray is my Favorite Color". The July 2002 Architectural Digest article A Dino-Sized House for the Jurassic Park Author and His Wife is now online. It features Michael Crichton’s house in Bedford, New York. There is also a slide show of 12 photos, many of which feature pieces from Crichton’s art collection, including Jasper John's Flag.